A dental implant is a small titanium root that serves as the replacement for the lower portion of a missing natural tooth. Dental implants can be placed in either the upper or lower jaws. Due to the biocompatible properties of titanium, a dental implant fuses with the bone and becomes a good anchor for the replacement tooth. Dental implants can be used as solutions for replacing single or multiple missing teeth. The fee for tooth replacement with dental implants depends on several factors, including the number of teeth being replaced and the number of dental implants required to support your replacement teeth. Some additional procedures may be required prior to the placement of your dental implants to ensure the long-term health of your dental implants. To obtain a specific fee estimate, it is necessary to have the doctor examine your mouth. After a thorough diagnostic examination, your dentist will recommend the treatment that is best for you. Anyone who is missing one or more teeth due to injury, fracture, disease or tooth decay may be a candidate for dental implants. The determining factor is the amount of available bone. Your dentist is the best person to evaluate whether dental implants are a viable solution for you. If I am older does age lower my chances of getting an implant? Occasionally, older patients express concern that their age may prevent them from enjoying the benefits of dental implants. However, health is more of a determining factor than age. If you’re healthy enough to have a tooth extracted, you’re probably healthy enough to receive dental implants. Certain chronic diseases may contraindicate dental implant treatment. Your Periodontist will determine if you are a candidate for dental implants after a careful evaluation of your dental and health history. Improved appearance: When you lose the entire tooth - crown and root - shrinkage of the jawbone may cause your face to look older. Dental implants can stop this process. A traditional denture or dental bridge doesn't. Preserve natural teeth: With traditional dental bridges, teeth adjacent to missing teeth are normally ground down to be used as anchors for a dental bridge. The protective enamel is removed. Additionally, crowns and bridges may need to be replaced several times throughout your life. Dental implants often eliminate the need to modify healthy teeth. Today, state-of-the-art guided surgical techniques are convenient alternatives to place dental implants and allow you to have the dental implant placed in a single session using keyhole surgery. This new method has significantly simplified the procedure, for both patients and periodontal surgeons. The major advantage of the guided surgical technique is the minimal amount of manipulation of the soft tissue due to keyhole surgery. The conventional process can take from two to six months. First, the periodontist places the dental implant, which is left for two to four months to heal and integrate with the jawbone. 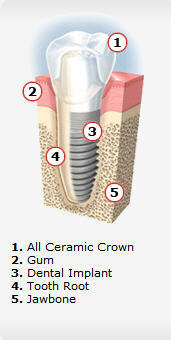 During the healing period, you are given a temporary prosthesis until the permanent crown is put in place. The procedure chosen depends on several factors, such as your dental health, the number of teeth involved and which teeth are replaced. These factors will also determine the total number of visits to the office throughout the treatment period. With any surgery, there can be some discomfort. Placing one implant normally causes less discomfort then placing several. Anesthesia and patient sedation are commonly administered to eliminate any discomfort during the dental implant process. Most patients report that they were much more comfortable following the procedure than they had anticipated. Your Periodontist will prescribe medications to ease any discomfort that may occur. It is normal to have some mild swelling in the gum and soft tissues. But usually the discomfort, if any, is treated with an ordinary painkiller. You should expect to be able to work the next day. Often patients comment that they are even more comfortable after implant surgery than an extraction. Your new teeth must be cared for and checked regularly, just like your natural teeth. Brush and floss as recommended by your Periodontist or dental hygienist.